These are excerpts from remarks by Robert T. Hastings, Senior Vice President, Communications & Government Affairs and Chief of Staff, Bell Helicopter, at the 4th National Summit on Strategic Communications on April 23, 2013 in Washington DC. I had the opportunity for about a year and a half to serve in the Pentagon as the head of Public Affairs (Acting Assistant Secretary of Defense for Public Affairs, 2008-2009). That experience was informative; in fact, it was transformational for me. I was hired because of what I had done as a corporate communications executive, but I was able to take communications to a different level in the Pentagon role, in a world you heard General (John) Allen talk about today: In war, where if you get it wrong sometimes blood flows in the streets. I believe in strategic communication. I believe it is a science. Strategic Communications is a new discipline. We have to do it, and we have to do it right. It is an evolution of communication practices from what most of us have encountered in the past. Cause a competitor or adversary to take (or refrain from taking) specific actions. In all the swirl about defining Strategic Communications and what do we do, it comes down to some very simple words. Strategic Communication is a synchronization of actions, images, and words to achieve a purpose. There are some key words in that statement. “Synchronization” is a key word. What is the difference between synchronization and coordination? Coordination is where you and I are trying to walk through that door and we decide, you go first instead of me so I do not walk on your feet. That is coordination. Synchronization is a complete step higher. It means you have figured out the optimal way to achieve something. Synchronization is optimal strategy and action. Then, having a “desired effect” at the end is really important. If you look at the latest definition of Public Relations written by PRSA, after a ton of work, they came up with establishing ‘neutrally beneficial relationships’ with stakeholders. There is nothing in there about an effect—what I’m doing in my job to make something happen. 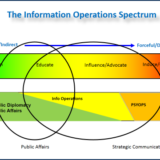 The Joint Integrating Concept, 2009 was a document that talked about Strategic Communications having four functions. And this is exactly what I do at Bell Helicopter today. It is exactly what we do. It says the job of Strategic Communication is to improve US credibility and legitimacy. That is what I do in a private sector corporation: Bell Helicopter. I’m working to improve the credibility of Bell Helicopter so that we win customers, keep customers, and satisfy our customers, which weakens our adversaries’ credibility. You don’t think I’m trying to make sure the Bell Helicopter has more credibility than our adversaries, the competitors? In a corporation, our objectives are not just sales. We have objectives around tax codes, laws, unions, community relations, tax abatements and even where traffic lights are placed so employees can get in and out of work easier. Those all are among objectives that we work on in our communications office (as well as causing competitors to take actions or refrain from taking actions). All those things I got from working in the Department of Defense. This is exactly what we do in Strategic Communications office at Bell Helicopter. Some of you will recognize this chart (attached). I think this chart illustrates the heart of the problem in Department of Defense with Public Affairs and Strategic Communications. DoD doctrine says that Public Affairs works down here (on the left-hand side of the chart). And when you talk with a lot of people who work in Public Relations, they will tell you this is where Public Relations is working. We inform, we educate and we do diplomacy. It’s all about exchanging information. To me, that is the “old school” communications. That style of communications and public relations will win you friends. But it is not communications that will succeed in today’s environment. I think you have to do much more. The problem that DoD is having right now with Public Affairs and Strategic Communications is where to draw the line: Right in here, wrapped up around influence. There are practical reasons why Strategic Communications stops at deception. The truth is still principle Number One in our business, for a number of reasons. One is you have got to look at yourself in the mirror. Two is we have laws that will land you in jail if you don’t tell the truth. Three, what happens if you lie and you’re caught? You lose credibility and you are out of business. But on this chart, all of the other functions including inform, educate, influence, advocate – moving individuals and groups to a desired action or behavior – that is our role in Strategic Communications.